This profound guidebook reframes and expands the mission of building a global culture of peace. 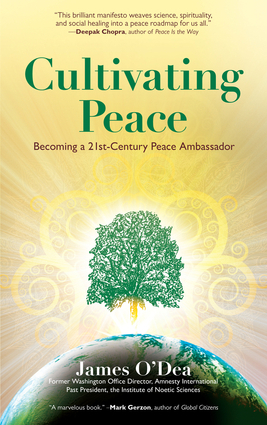 Going far beyond conventional techniques of conflict resolution, James O’Dea provides a holistic approach to peace work, covering its oft-ignored cultural, spiritual, and scientific dimensions while providing guidance suitable even for those who have never considered themselves peacebuilders. O’Dea is unique in his ability to integrate personal experience in the world’s violent conflict zones with insights gathered from decades of work in social healing, human rights advocacy, and consciousness studies. Following in the footsteps of Gandhi and King, O’Dea keeps the dream of peace alive by teaching us how to dissolve old wounds and reconcile our differences. He strikes deep chords of optimism even as he shows us how to face the heart of darkness in conflict situations. His soulful but practical voice speaks universally to peace activists, mediators, negotiators, psychologists, educators, businesspeople, and clergy—and to everyday citizens. James O’Dea is a renowned figure in international social healing who has conducted healing and reconciliation dialogues for twenty years and was director of Amnesty International’s Washington, DC, office for over ten years. His work as codirector of the Social Healing Project led him to Rwanda, Israel/Palestine, and Northern Ireland. The lead faculty of the popular Peace Ambassador Training hosted by the Shift Network, James is also on the extended faculty of the Institute of Noetic Sciences and is its immediate past president. He is also a member of the Advisory Board for the Peace Alliance.